Home - The Ray | Let's drive the future. - The Ray | Let's drive the future. What if we reimagine the way we connect our communities, our lives, and our world? Join with EV advocates and enthusiasts from across the state on a 30-mile caravan from Atlanta to Serenbe where the caravan will join Ray Day, the annual celebration of the life and legacy of green pioneer, Ray Anderson. How does a solar road work? What is the environmental impact of underinflated tires? The Ray is constantly evolving our expectations for a highway. In this ever-changing environment, there's a good chance you might have a question. Here you can see questions we've answered and pose your own. We look forward to hearing what you want to know more about - let's talk! If you grow crops in the right-of-way, would the chemicals and metals in water running off from the highway threaten them or bio-accumulate in them? Solar roadways are an exciting idea. If another city or state wants to launch a Wattway pilot, where can they start? How do pollinator gardens help a roadway? Please help me understand the connection. "If you grow crops in the right-of-way, would the chemicals and metals in water running off from the highway threaten them or bio-accumulate in them?" As long as internal combustion engines still dominate the road, growing crops in the right-of-way is impossible because of the chemicals and pollutants that make their way into the denigrated soil of the right-of-way. However, we see this as an opportunity. Choices are constantly being made about whether land should be used for food or energy production. Because the right-of-way is incompatible with food production, we have an opportunity to relieve some of the pressure for more energy production on food-compatible land and move it to the right-of-way. Additionally, other non-food crops can be grown in the right-of-way. On The Ray we have a perennial grain pilot. This grain will produce fibers that can be used in the production of highly disposable goods like diapers, napkins, and paper towers. "Solar roadways are an exciting idea. If another city or state wants to launch a Wattway pilot, where can they start?" "How do pollinator gardens help a roadway? Please help me understand the connection." The first thing to understand is that all along the right-of-way, decisions have to be made about the ground cover. Dirt and gravel are unsightly and lead to erosion issues, so departments of transportation look to vegetation. This is why you usually see turf grass lining the road. However, turf grass has a shallow, fragile root structure that makes it difficult to grow, and it requires extensive, regular mowing. We think there are better options and one that we particularly like is the pollinator habitat. Native pollinator meadows use native plants that are drought resistant and optimized for the local climate. They have deep root structures that prevent erosion and protect our water systems from roadside pollution. Pollinator habitats (obviously) provide a home for bees, butterflies, and other pollinators that are critical to the success of our agricultural communities. By choosing pollinator meadows as the ground cover management strategy the right-of-way, we can secure acres of land for these important species for decades. And did we mention that they’re beautiful and can make a road trip or long commute just a little bit better than it would be otherwise? 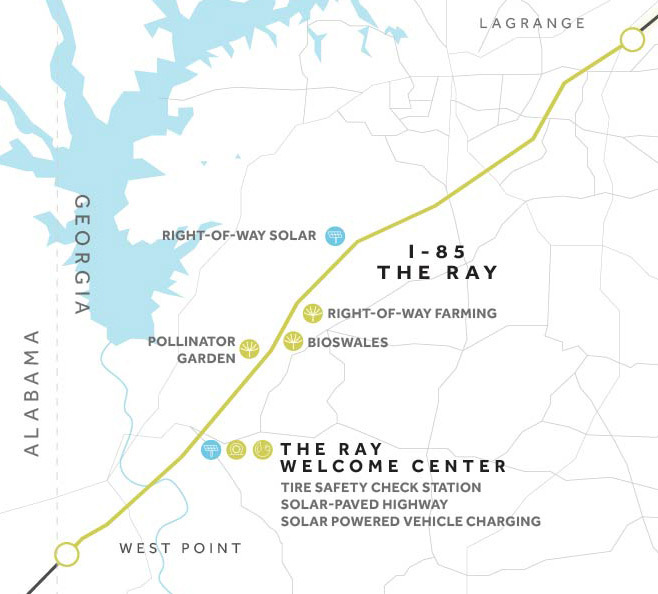 The Ray is a proving ground for the evolving ideas and technologies that will transform the transportation infrastructure of the future, and it starts on 18 miles of West Georgia’s I-85, and the land and communities surrounding it. By innovating from the ground up, we’re creating a corridor that reconnects and restores us, paving the way to a safer and more prosperous future for all. We’re implementing new ideas and technologies to create a regenerative highway ecosystem on The Ray’s 18-mile stretch of I-85, and several pilot projects are already underway. Check out our Technology Showcase to learn about our solar-powered vehicle charging, tire safety check station, solar-paved highways and all our other exciting pursuits. As the pioneering founder of carpet company Interface, Ray C. Anderson is a globally-recognized environmental leader who ushered sustainability into the business mainstream. In 2014, an 18-mile stretch of I-85 in Troup County, Georgia was dedicated in his honor. The Ray celebrates and extends his legacy on this corridor through ongoing innovation and discovery. Zero Deaths. Zero Waste. Zero Carbon. Zero Impact. It’s an ambitious goal, but using The Ray as a living lab for innovative ideas and technologies, we’ll set a new standard for roadways across the globe. How the legacy of a visionary is still changing the world. The Ray is one of the Weather Channel’s Top 10 Ways To Save The World. Link to the video on your youtube page. How could a dirty road be the earthly embodiment of Anderson? We’re asking how we can better design highways.